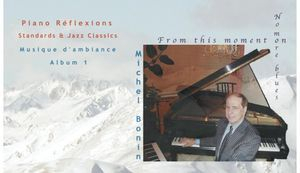 - a physical CD Album at $14.95 CAD + shipping fee in HiFi quality with the print illustrated liner notes. The 15 tracks on Album #1, mostly medleys of over 30 tunes, offer a unique blend of keys, breathing and groove, rhythm and contour (the sequential ups and down of the melodies). The piano/keyboard version follows the classic ‘final chart’ for American standards using the predominant key of the sheet music or an accurate transcription when no chart was available. The urge of letting spontaneity in comes from the following key-characteristics of the interpretations, giving the soul more tunes to reflect upon. For instance, only what is essential is kept to recreate the lounge music style: From Spencer Williams’ “Basin Street Blues” dispensed with any Dixieland rhythm section, to Randy Aldcroft’s 1975 “Breakfast Wine”, relying for simple effect on the switch of keys. Most tunes average under two minutes usually without the intros, endings, B sections, fills and in the absence of repeated chord extensions, like “It’s A Blue World” and “Jukebox Saturday Night”. Some tunes even play under a minute, like Turk–Ahlert’s 1931 “I Don’t Know Why (I Just Do)” and Harold Arlen’s 1933 “It’s Only A Paper Moon”. At its simplest expression, variety comes from the blue notes created by the alternate change of chords and keys, like Jerome Kern’s 1939 ‘medium swing’ show tune “All The Things You Are” and Hart-Rogers’ I Didn’t Know What Time It Was”. Or it may be an occasional change of time, like Frank Rosolino’s 1959 composition, “Blue Daniel”, from a medium jazz waltz to a ballad. A ‘slowly with much feeling’ time feel, is showcased, sometimes at half the predominant beat per minute metronome markings, like “Anthropology”, a fast bebop composed by Charlie Parker and Dizzy Gillespie in 1946, turned into a languorous ballad at 112 bpm (Beat Per Minute). For instance, “Black Narcissus” by Joe Henderson (1980), the second medium jazz waltz on the album, played at 66 bpm instead of the suggested 130 beat and Ornette Coleman’s “Blues Connotation” (1962) best known for a fast swing tempo rendition like 264 bpm played instead at 106 bpm. Easy listening of legendary tunes is a reminder that cocktail lounges, bars and clubs were once known as saloons. Shot down in the early 1920s, one could soon hear live music again amid the whispers at speakeasies: From Freed-Arnheim-Lyman’s “I Cried For You” released in 1923, to the Simons-Marks’ 1931 swing melody “All Of Me”. Charles Aznavour shows a sorrowful European style originating from France and beyond. “Aime Moi” (Love Me) shows Aznavour’s genius for the sad romantic composition style, with song lyric by Jacques Plante. It was produced in 1966 for the French Musical "Monsieur Carnaval", after the end of the golden years of French popular music in America. Cole Porter represents the optimism rooted to the New World. The two tunes sung with English lyric, are from Cole Porter considered by many the master of the American Musical Theater between 1932 and 1954: “All of You” (from "Silk Stockings") and “From This Moment On” (from "Kiss me Kate") flagshipped in the title of this album.